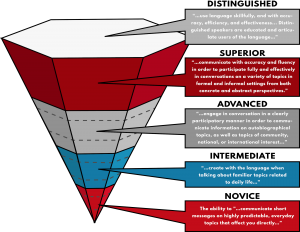 Language proficiency is the ability to use a language spontaneously for real-world purposes. There are many different ways to understand and to measure proficiency in a language. One widely recognized framework is the American Council on the Teaching of Foreign Languages (ACTFL) Proficiency Guidelines, which describe characteristics of proficiency in four different skill areas: speaking, writing, reading, and listening. If you are interested in a career in the government, the scale that’s used to assess proficiency is the one developed by the Interagency Language Roundtable (ILR). The ILR scale is similar to the ACTFL scale. How long will it take me to become as proficient as I would like? For example, if your first or native language is English, it will most likely take longer for you to reach a given level of proficiency in Arabic than in French. It takes longer to move from Intermediate to Advanced than it does to move Novice to Intermediate. How do I find out my proficiency level in the language I am studying? For most of the languages taught at UW-Madison, your proficiency in speaking can be assessed through an Oral Proficiency Interview (OPI). The OPI is a short interview in which a certified OPI tester elicits a sample of your speaking performance in the language. Official assessments can be purchased through Language Testing International (LTI), a partner of ACTFL. Online testing in certain languages is available through LTI’s Profluent+. If you’re not looking for a formal assessment of your proficiency level, try a self-assessment like the NCSSFL-ACTFL “Can-Do” checklist. Meet with the advisor of your language or the International Directions Advisor with the Language Institute.